Published in Ark. Bot., ser. 2, 7, 1: 135. 1968. Type: Canada: "Hudson's Strait", 08.1884, leg. R. Bell. Holotype: CAN 11298. Synonymy. Antennaria angustata Greene, Pittonia 3: 284. 1898. Antennaria pygmaea Fernald, Rhodora 16: 129. 1914. Antennaria. burwellensis Malte, Rhodora 36: 111. 1934. Antennaria. tansleyi Polunin, Bot. Can. East. Arctic 1: 357. 1940. Antennaria. tweedsmuirii Polunin, Bot. Can. East. Arctic 1: 357. 1940. Vegetative morphology. Plants 2–13(–15) cm high; perennial herbs; caespitose, or not caespitose. Only fibrous roots present (fibrous roots arising from the underground stem, flowering stems monocephalous, or rarely with 2 – 3 heads). Ground level or underground stems horizontal, or vertical; stoloniferous; elongate (20–40 mm long), or compact; (0.8–)1–3 mm wide. Caudex present (a narrow zone at ground level). Aerial stems developed; erect. Leaves present; mainly basal, or basal in a rosette; alternate; marcescent. Petioles absent. Leaf blade bases truncate, or attenuate. Leaves not grass-like. Blades 9–18 mm long (basal leaves), 2–4 mm wide (with prominent flags, brown membranous scale-like tissue at the end of the herbaceous portion of the blade, on both lower and upper stem leaves), spreading, oblanceolate (spoon-shaped to oblanceolate), flat, with inconspicuous veins. Blade adaxial surface glabrescent or hairy, hairs pubescent (if applicable), hairs simple, hairs sparse or moderately dense (if applicable), hairs white, or translucent. Blade abaxial surface without sessile glands or glandular hairs, hairy, hairs puberulent, hairs very dense, hairs white, hairs straight or curved, hairs appressed or spreading. Blade margins entire; apices acuminate, or acute. Reproductive morphology. Plants dioecious (male plants unknown; gynodioecious). Flowering stems solitary; with leaves (4–11 mm long). Flowering stems hairy. Flowering stems villous. Flowering stem hairs simple; white or translucent. Inflorescences solitary heads (usually, 2–3 heads rarely); globose or sub-globose; 0.7–1.2 cm long; 11–14 mm wide. Flowering heads 8–12 mm deep; 11–13 mm wide; with only disc florets. Pedicels absent, or subtending flowering heads (short when a second capitulum is present); with non-glandular hairs. Involucral bracts present. Number of rows 2–3. Outer involucral bracts mostly green (narrow, acute, the upper scabrous, part brown, lower portion dark brown, black, or olivaceous); lying adjacent to the flowers; lanceolate; 5–6 mm high; 1–2 mm wide; glabrous (at the apex), or sparsely hairy (with long hairs on the margins at the base); without glandular hairs. Inner involucral bracts lanceolate; 6–6.5 mm high; 1.2–1.3 mm wide; margins wide, scarious for at least one quarter of the bract (at apex); apex entire (acute). Flowers radially symmetrical (actinomorphic); unisexual. Sepals represented by a pappus. Pappus with a single row of hairs; whitish. Disc florets pappus 4–5 mm long. Petals conventional; fused; 5; white (total flowering head), or red, or pink, or purple (in the lower 75%; transparent in the upper portion); 4–4.5 mm long. Corolla tubular; 5-lobed. Stamens absent. Ovary inferior; carpels 2; syncarpous. Styles 1; 4.5–5 mm long. Stigmas per ovary 2. Placentation basal. Ovules per ovary 1. Fruit sessile; dry; cypselas; yellowish, or brown; 1–1.3(–1.8) mm long (CAN 234055); glabrous (usually); surface appearing veinless; indehiscent. Seeds 1. Chromosome information. 2n = 56, or 70–120. 2n = 100 ± 20. Mosquin and Hayley (1966, A. angustata). Ploidy levels recorded 8x, 9x, and 10x. Ecology and habitat. Substrates: slopes, ridges; imperfectly drained moist areas, solifluction slopes, moderately well-drained areas. Most often found on the disturbed margins of solifluction lobes or on unstable, moist, gravelly sloping tundra. Sandy, flats of old beach head around old Eskimo site (CAN 234955); on hillside with the influence of sea spray (CAN 518119). North American distribution. Alaska, Yukon, Northwest Territories Islands, continental Northwest Territories, Nunavut Islands, continental Nunavut, northern Quebec, Labrador. Arctic islands: Baffin, Devon, Parry islands (?CAN 500011), Banks, Southampton, Coats (Digges and Resolution islands, Melville Peninsula). Northern hemisphere distribution. Amphi-Beringian, or North American. West Chukotka, South Chukotka, East Chukotka, West Alaska, North Alaska  Yukon, Central Canada, Labrador  Hudson Bay, West Greenland. Within the concept of A. monocephala s.l., Hultén (1968b) circumscribed the apomictic form of the species as A. monocephala subsp. angustata, extending the range of the species to northern Yukon and Alaska and across the Canadian Arctic into Greenland and down the western Cordillera into Montana and Wyoming. 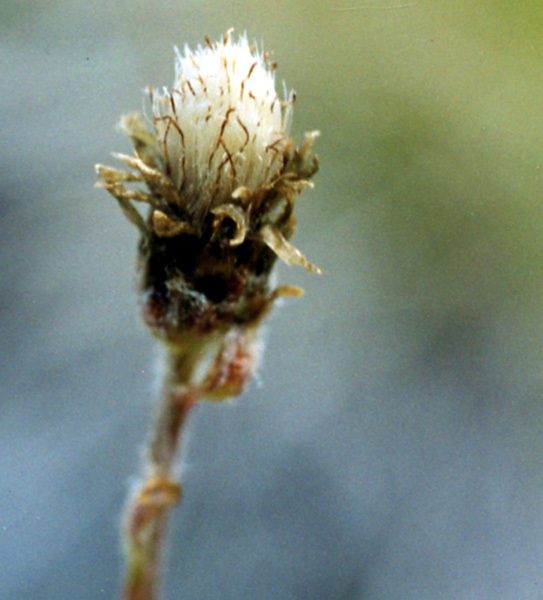 Bayer (1993) chose to follow Hultén's broad concept of A. monocephala and accepted Antennaria monocephala (Torrey and A. Gray) DC. subsp. philonipha (A.E. Porsild) Hultén [Ark. Bot., ser. 2, 7, 1: 135. 1968a], which was described from Canada: "Arctic coast, east of Mackenzie, near Kittigazuit". In this taxon male and female plants are equally frequent and probably sexual. 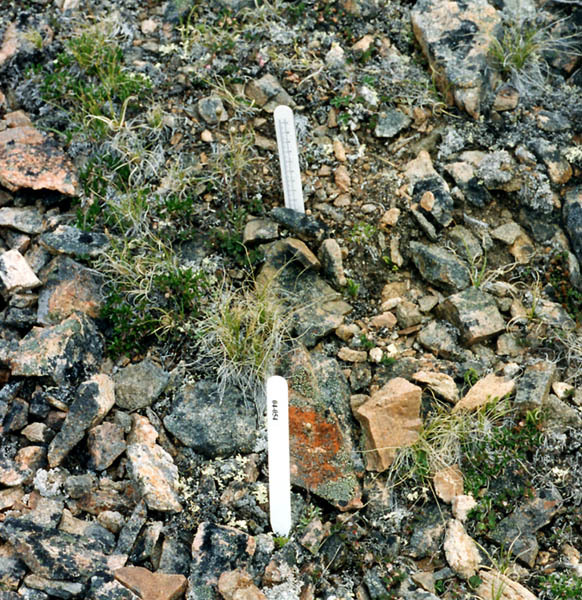 It occurs almost exclusively within the range of A. monocephala in Alaska, Yukon, and westernmost Nunavut, and it hybridises with A. monocephala s.s. (Porsild and Cody 1980). The taxon is synonymised with A. monocephala subsp. monocephala by Bayer, in Cody (1996). It is suggested that there is some polymorphy in sexual A. monocephala that includes A. philonipha. Chmielewski and Chinnappa (1991) considered gender dependent and independent morphological dimorphism in sexual and apomictic members in A. monocephala s.l. and concluded that it is appropriate to recognise two subspecies, A. monocephala subsp. monocephala and A. monocephala subsp. angustata (Greene) Hultén. These authors indicated that these subspecies differ with respect to tomentum, chromosome number, reproductive biology, and (in part) provenance. They treated A. monocephala subsp. monocephala as a sexual diploid (2n = 28) and A. monocephala subsp. angustata as an apomictic polyploid, with chromosome numbers ranging from tetraploid (2n = 56) to octoploid (2n = 112). In A. monocephala subsp. monocephala, the adaxial surface of the basal and cauline leaves is glabrous-strigose, as is the stem. In A. monocephala subsp. angustata, the adaxial surface of both basal and cauline leaves is floccose-tomentose, as is the surface of the stem. Chmielewski et al. 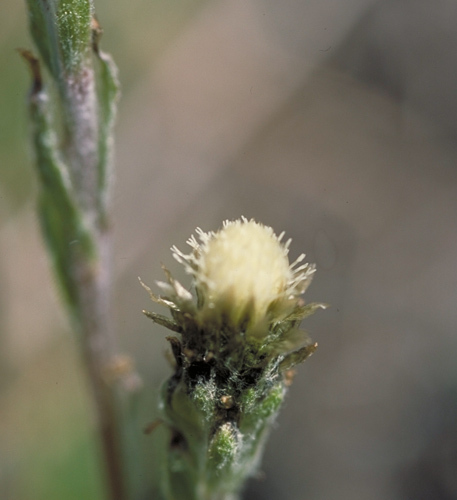 (1990) examined the pollen morphology of North America species of Antennaria (Asteraceae: Inuleae) and described the grains of A. monocephala as 18.3 ± 0.8 um long in polar diameter and 18.4 ± 0.9 um long in equatorial diameter and striate-perforate-reticulate. These authors also provided an SEM illustration of a grain. 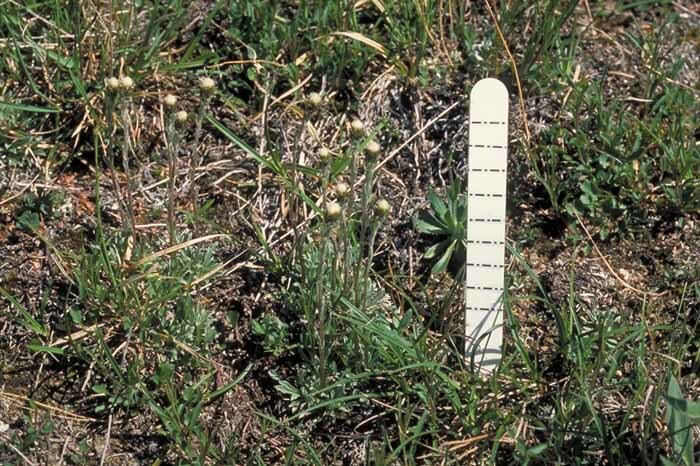 Antennaria pygmaea was described from Labrador. Scoggan (1979) kept A. pygmaea as a separate species based on involucral bract criteria. 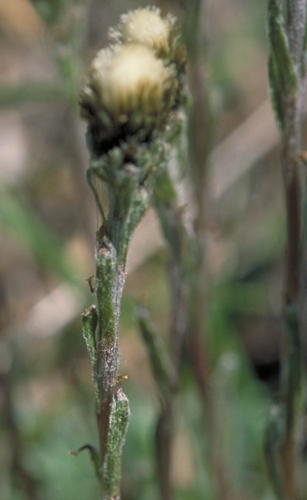 Bayer, in Cody (1996), synonymised A. pygmaea with A. monocephala subsp. angustata. Male plants are unknown, and it is most probably agamospermic like the other entities synonymised with A. monocephala subsp. angustata. Illustrations. • Habitat. Plants growing beside the markers on a rocky south facing slope. Nunavut, Baffin Island, Ogac Lake. 11 July, 2004. Aiken and LeBlanc 04–054. CAN 586522. • Habitat. 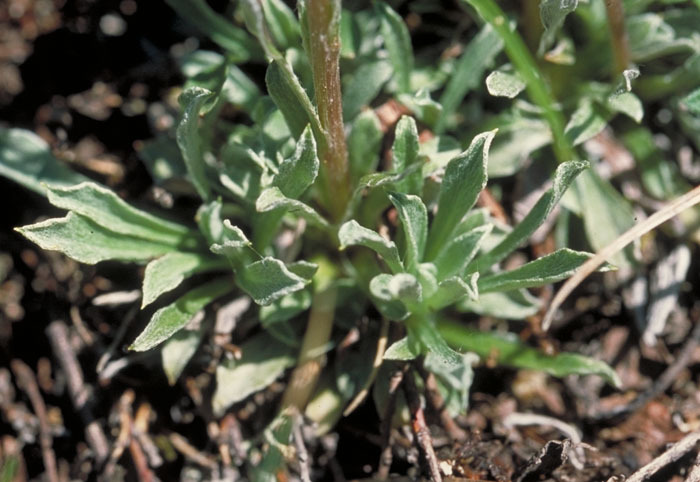 Plants, approximately 10 cm high with dense white single flowering heads, growing on dry grassy slope. Nunavut, Baffin Island, Soper River Valley, near Mt. Joy. Aiken 02–044. CAN. • Close-up of leaves. Oblanceolate flat leaves to 25 mm long in a basal tuft. Veins inconspicuous. Leaves greyish green from simple pubescent hairs on the upper surface. Towards the mucronate leaf tips, the undersurface of the leaves is curled up and shows the white tormentose hairs. Aiken 02–044. CAN. • Flowering stem. Flowering stems villous with hairy flag leaves 7–14 mm long with prominent brown tips. Aiken 02–044. CAN. • Flowering head and flag leaves. Left, leaves on a flowering stem, with brown "flag" tips. Below, close-up of flowering head composed of only disc flowers with no stamens and with forked stigmas that are protruding. Aiken 02–044. CAN. • Close-up of older flowering head. Flowering head with old brown styles and stigmas. Nunavut, Baffin Island, Ogac Lake. 11 July, 2004. Aiken and LeBlanc 04–054. CAN 586522. • Arctic Island Distribution.